Today marks the kick-off of a brand new sub-series within the Journey, as I’ve begun to call it: What We Learned. In this new sub-series, I’ll be doing a review of the annual trends we’ve seen in each of the top leagues to produce NHL prospects. The leagues on the list to be covered include the three individual CHL leagues, the USHL, and the SHL. I selected these five based on the trends of the last three NHL entry drafts, where they’ve not only been the top-5 leagues to produce drafted players, but also provided some of the top quality in the draft as well. Each article will cover a small group of trending prospects, both drafted and undrafted, as well as what to expect from a typical prospect coming out of such a league. This week, we’ll kick off the series with the Swedish Hockey League (SHL), arguably the top Scandinavian professional hockey league (though I know if my fellow Dobberite Jokke Nevalainen finds this line, he might have something to say about it). As a precursor to this article, I’d like to give a very important shout out to Kyle Stewart, Dobber Prospects writer who’s currently covering the SHL on a monthly basis. Some of the recent players to join the NHL ranks after being drafted from the SHL include Rasmus Dahlin (BUF), Lias Andersson (NYR), Kristian Vesalainen (WPG), Sebastian Aho (ISL) and Carl Grundstrom (LAK). Now it’s important to note before we get too deep, that several other players have passed through the SHL en route to the NHL. For this section, however, we’re simply focusing on players to have played in the SHL in the year preceding their draft. For the most part, these players have been selected in the top-3 rounds of the draft, with several others in that range who haven’t become household names quite yet. This year, we’ll look for players such as Brynas’ Victor Soderstrom, Frolunda’s Sameul Fagemo, and SV71’s Simon Holmstrom to become those players. For a detailed look at some of these guys, have a look at Kyle’s March edition of the SHL report. Frankly, this year’s entry-draft is looking like it will be a little shallow, relative to what we’re used to seeing out of the SHL. In lieu, it’s more likely that we see several players selected early-on, who’ve competed in the Allsvenskan league this year. When drafting a player from the SHL, it’s important to keep in mind that despite the fact that they do currently play against a predominantly adult competition, their transition to the NHL can be impeded by several other obstacles. 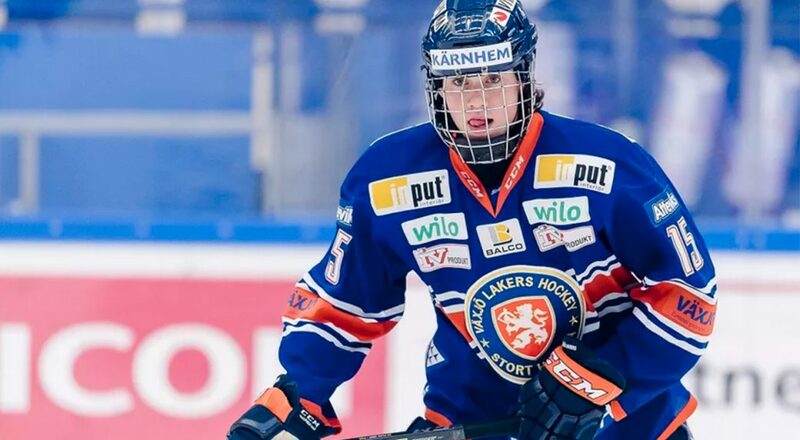 In the past, a trend we’ve seen from some of the higher NHL draft pick’s from the SHL is that they’re relatively safe picks – Lias Andersson, for example, is a player who does just about everything right, night in and night out. His offensive ceiling, however, was never touted as a trait that would see him producing at the same level as many other top-10 picks. Rasmus Dahlin is the exception, of course. His undeniable puck-skill in small areas, paired with top-notch skating and agility made him much more than just a safe pick. What it comes down to, is that for those reasons, players from the SHL who are selected at the top-end of the NHL draft should be given extra consideration on fantasy draft day – their offensive upside very well may not align with their draft slot. Of course, this is a pretty general rule that there will always be exceptions to – it’s simply something to keep in mind for the casual fantasy scout. As far as what we’ve really learned in the SHL this year, is that it’s been an excellent league to screen players in their draft+1 campaign. Of the 30 total players drafted from one of three Swedish leagues last June, many have made an attempt to join the top tier, SHL this season. Players such as Nils Holgander, who played between the SuperElit league, and the Allsvenskan, as well as Fillip Hallander who spent most of last season in the Allsvenskan league have made the jump to the SHL. Hallander, in particular has put himself on the map in fantasy circles amongst first-round picks, despite falling to 58th overall in the draft last June. It’s players like these who benefit the most from the way that the SHL can expose unidentified parts of their game. If there’s one thing that I hope you can take from this piece today, it’s that when overseas players, or any young players for that matter, have a new opportunity to audition themselves, it's important to take note. To wrap things up, I wanted to offer my thoughts on the top-5 fantasy keepers currently playing in the SHL. If this name isn’t on the top of your prospect registry by now, I recommend doing a quick search on Twitter, and in the Dobber Prospects search engine. The Columbus fourth-round draft-pick has broken out in the league at the age of 19, giving the Jackets the confidence to trade some of their former top-prospects at the recent trade deadline. In finally his first full SHL campaign, the 20-year-old Boqvist has added poise and consistency to his resume of high-level edgework and creativity. His reliance on being able to outsmart opponents in small areas should translate to the NHL within a couple of years. A full-time move to the SHL has expanded Bokk’s game, giving him the confidence to express his elite puck handling skills, and the extra space to show it off. He can be an extremely dangerous playmaker, but simplifying his game when the time is right might make him a more effective NHLer in the future. A methodical forward who exerts himself at all ends of the ice, Davidsson has the skill set to produce offense at a competitive level in the SHL, but won’t top the score sheets in North America. His likelihood of making it across the pond is pretty good, but expect to find a third-line coaches dream when he does make it. The undersized Bruins prospect has found his niche with Farjestad this year, and it just happens to be scoring goals. He played on a talented squad to get there, but this glimmer of pure talent is a sign that the sixth round pick could have a future playing in North America. Honorable Mention: Matthias Brome, unrestricted free agent & Mora – Brome has been drawing significant interest from several NHL teams and could consider making a move for the right deal in North America. Thanks for tuning in to the first episode of the What we learned sub-series. I’d love your feedback here on on Twitter @olaf1393. Check back next week for a look at the USHL.